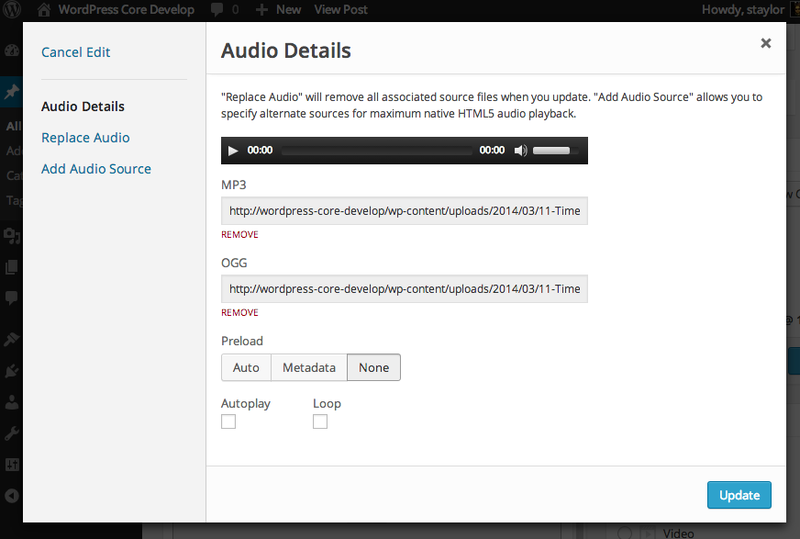 Is Audio/Video modal stuff able to be integrated into separate fields from TinyMCE yet? Or too early to try testing that? // shortcode is the updated shortcode, do something with it. Is there a version of the modal to be used outside of shortcodes and the editor, like how you can use the media select modal in plugins? I honestly hadn’t thought about other use cases until Scott’s comment. 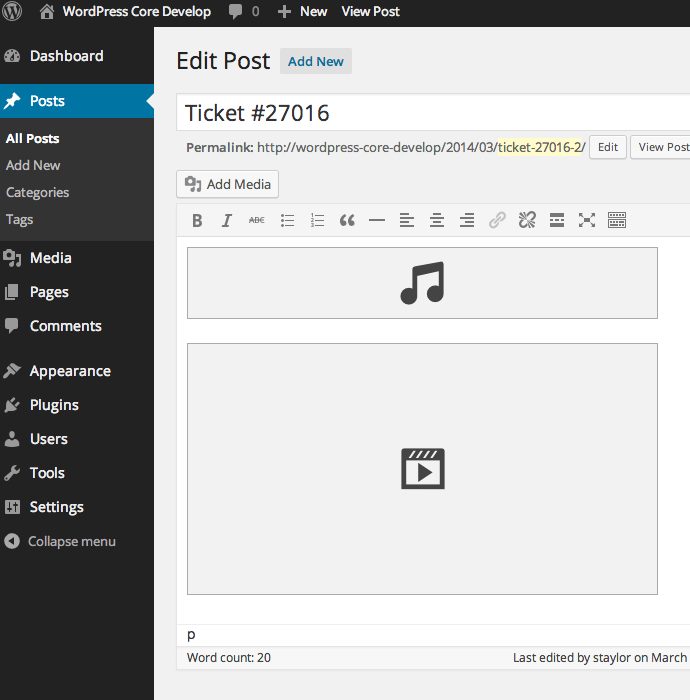 All of the code is in media-editor.js, media-models.js, and media-views.js which get loaded via `wp_enqueue_media()`. If those files + MediaElement are loaded, you can do whatever you want. 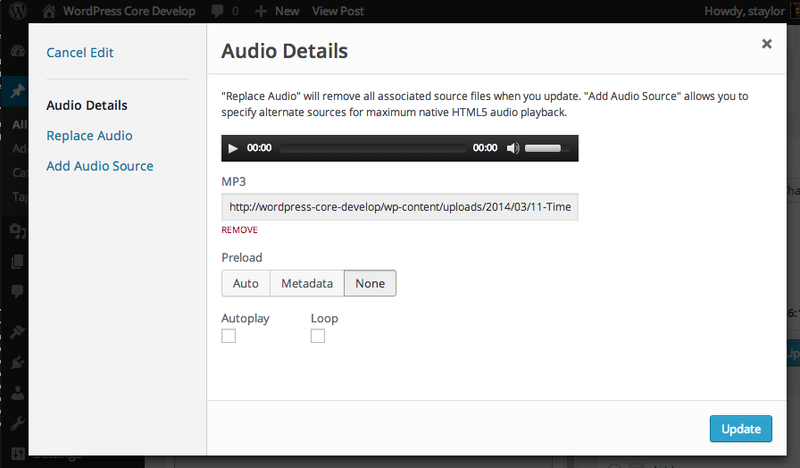 The admin glue is the “wpgallery” TinyMCE plugin where we have shoved all of the shortcode handlers, playlists too. So, you need your own glue, but see my above comment, it’s pretty easy. So basically, I’d have to encode the data into shortcode before I could even use this modal, then. 1. What kind of metadata and how is it formatted? is it just a hash of audio type and url? 2. Will the same events shown above ( ‘update replace add-source select-poster-image add-track’ ) work with this code? 3. (wait, didn’t I ask for 3?) what does detach do? Thank you and sorry for all the questions. Digging through the code is tricky because I’m still new to backbone so I’m glad that people in the know such as yourself are will to share the knowledge. Can’t wait for documentation. 3. Removes the frame from the DOM when the state is to be discarded or the modal is closed. 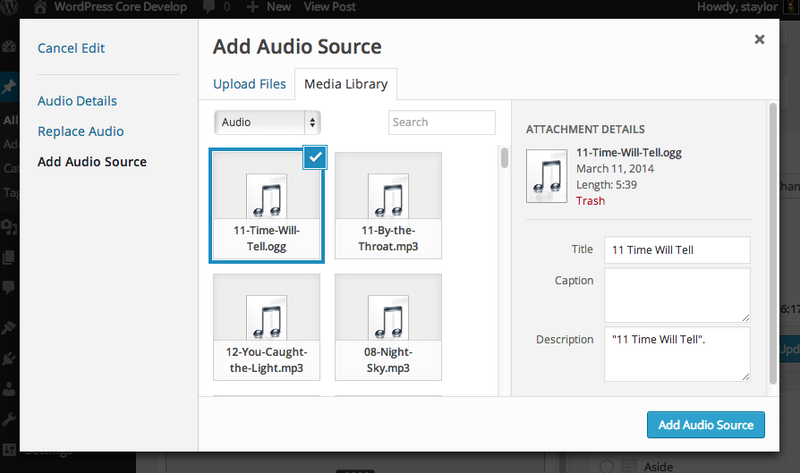 I love that I can upload audio files and have my own player without embedding cross-domain scripts. This is awesome. I think that this page https://codex.wordpress.org/Media_Library could be made like this: https://codex.wordpress.org/Embeds or this: https://codex.wordpress.org/Child_Themes It’s super informative and it’s the only source of information that I’m able to understand quickly and use in plugins and themes. 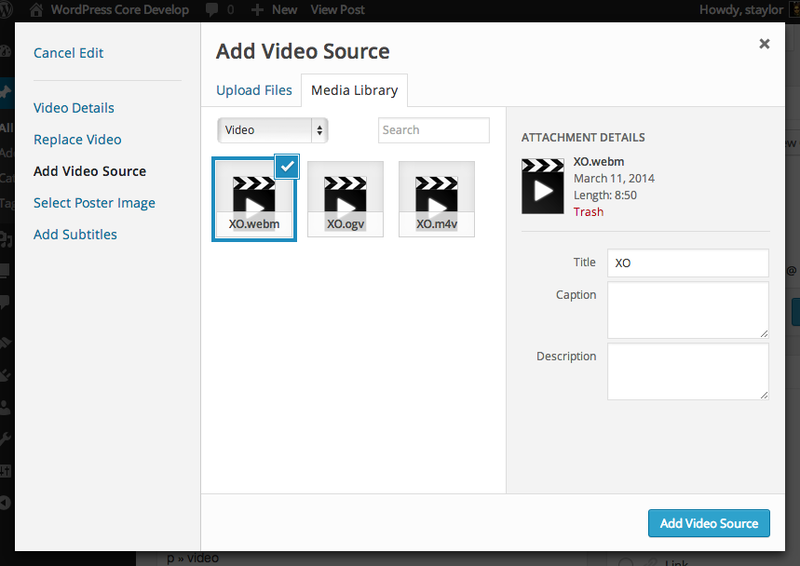 This new media library is an AWESOME step forward. You’re great! 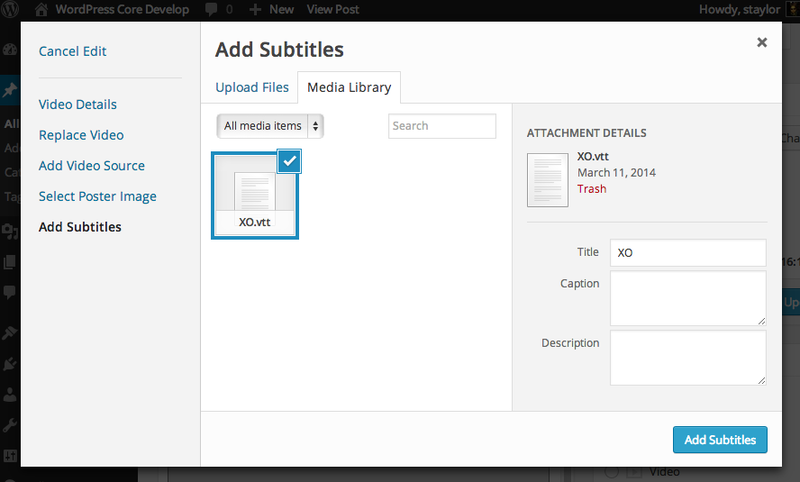 Where is the relationship between video and subtitle file stored? 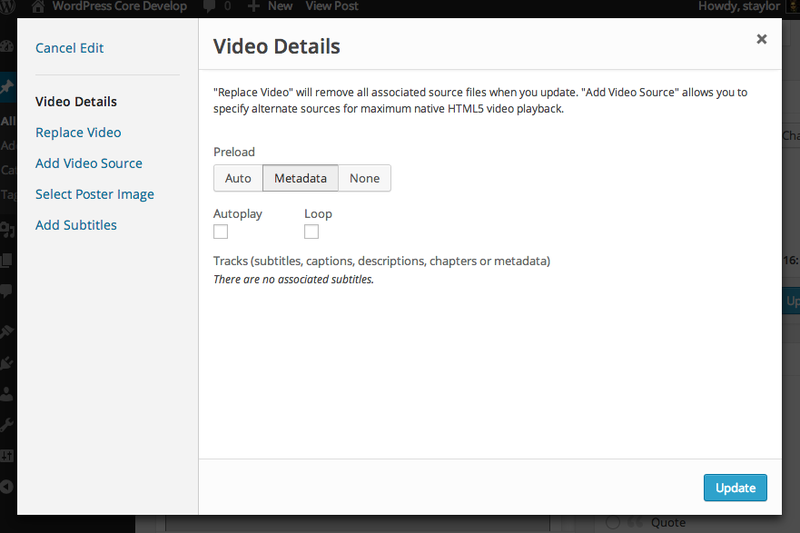 I’ve played with the latest nightly and I can’t find anything in the posts, postmeta, or options tables that indicates which subtitle file goes with which video. I’d like to be able to query videos with subtitles vs. those without.